Smartphones are all the rage now-a-days. It seems like everyone’s got one, and while most people only use them for games and web browsing they are extremely powerful devices. Since so many people enjoy all the capabilities of smart phones, we’re often somewhat disappointed when we turn on the old TV. If you’ve found yourself in this same situation, then this is the post for you. We’re going to review all the top devices and by the end of this post you’ll know which one meets your needs and quenchs your thirst for content on your TV. DLNA – The Digital Living Network Alliance (DLNA) is a non-profit collaboration established by Sony. What that means for you is that devices which are DLNA compliant will allow you to share digital media on your network. If you have pictures, music, or videos on your desktop computer a DLNA enabled device will be able to access that media and play it on (in this case) your TV. HDMI – This term shouldn’t be vague to most people at this point, but if you’re not familiar with it we’ll define it for you. HDMI (High-Definition Multimedia Interface) is a compact audio/video interface for transmitting uncompressed digital data. It offers the ability to transmit Audio, Video and Data across a single cable. Roku – Roku may be the biggest name in the industry. They were one of the first to market and have had success with a handful of different models. We’re specifically looking at the Roku 2 XS, which retails for $89.99. Pros: Very easy to setup. Simply plug in power and an HDMI cable to your HDTV, connect to WiFi and you’re up and running; Offers Youtube Channel (unlike some Roku models); Offers all the standards you’d expect like Facebook, Netflix, Hulu, Pandora & etc. And now offers games like Angry Birds; 1080P Support. The bottom Line: Overall a good device, but lacks some of the features you’d really like to see in this type of device. 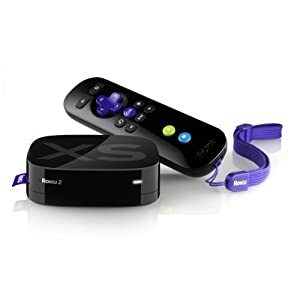 We give the Roku 2 XS 3 shields out of 5. Apple TV – If you’re an Apple iOS fan, then you probably already know about Apple TV, which is now in it’s second revision. If you don’t already own one you’re probably curious if it’s going to fit your needs. Unfortunately it probably won’t. The good news is that, unlike most Apple products, it isn’t terribly expensive. Retailing at just $99 it’s right at home in this market. 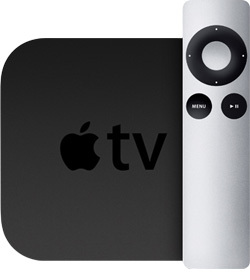 Pros: Offers the ability to play iTunes content on your TV and home entertainment system; Very easy to setup (similar to Roku); Offers the ability to stream from iPad and iPod to your TV (screen mirroring via AirPlay); Sleek design and simple remote control; 1080P Support. The bottom line: The fact is that Apple, like many large corporations, doesn’t want you to have options if those options might limit their profits. While most devices in this category are about opening doors and helping users get the content they want, Apple TV is all about closing doors and limiting what you can do. If you’re not an iOS user, or if you don’t really care about screen mirroring or iTunes on your TV… Avoid this box. We give Apple TV 3 shields out of 5. Vizio Co-Star – The latest implementation of Google TV leaves much to be desired. Since many video sources and websites block Google TV from streaming, you’re going to have limited options with this box. Vizio is a great company that has been on the rise in recent years, and the limitations of this product really aren’t a reflection of them. Pros: Nice double sided remote with touchscreen and full keyboard; It’s in the affordable $100 range; DLNA available via app. We give the Vizio Co-Star 2 shields out of 5. Smart TV’s – Many manufacturers are offering upgraded models of their TV’s which take advantage of this new technology. Samsung may be leading the way but they’re not the only ones getting in on this game and capabilities may vary between manufacturers. Many offer a standard set of apps which typically consist of weather, news, stocks, and Netflix. Some offer the ability to download additional apps. Be weary of models without built-in WiFi as models requiring dongles often don’t function as well. Pros: No installation, everything’s built-in; Uses the TV’s remote. Cons: Often limited on what apps are available; The added expense of a Smart TV is often more than adding a separate device; Often seem sluggish due to limited system resources. The bottom line: If you’re looking for simplicity and ease of installation, a Smart TV may be for you. If you’re looking for a more robust device with more capabilities you can save money buying something else. We give Smart TV’s 2 shields out of 5. Android Mini PC – We’re most excited about this line of devices. If you’re looking for a true “Smart Phone” experience on your TV then an Android Mini PC is the answer. With a fully capable web browser utilizing both HTML5 and Flash content you’ll be unstoppable on the web. Android means full access to the Google Play Market and all the games and apps available therein. From Netflix to Angry Birds, nothing is out of the question. Small form factor means it’s portable; you can take it on vacation, to a friends house, or anywhere you go for that matter. Some models even have the HDMI connection built-in so you won’t even need an HDMI cable. Cons: No-name manufacturers may take you outside your normal comfort zone when making a purchase (although this isn’t much of a con for most people due to the extremely budget friendly price point). The bottom line: We can’t stress this enough, the only way you should go with another device is if you’re committed to having iTunes on your TV. 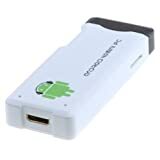 And even if you decide to go with Apple TV, an Android Mini PC would be an excellent backup device to take up the slack for Apple’s short comings. We give Android Mini PC’s 5 shields out of 5! I hope this has been beneficial to you. No matter your choice, the future of television is here and Smart TV is it. Enjoy! It’s actually a great and helpful piece of info. I am glad that you shared this helpful info with us. Please keep us informed like this. Thank you for sharing. Great article. There are many products on the market that are very high tech, and they only continue to advance as time goes on. Custom home theaters have become very popular in our time. These theaters typically have surround sound, universal remotes, 3d television capabilities and more. Thanks for sharing.